Further, the projects DanTysk, Sandbank and the Helgoland-cluster of Amrumbank West, Nordsee Ost and Meerwind Süd/Ost are also having a negative impact, said NABU. It lodged a formal complaint against the German government with the European Commission on 20 March 2019 for failing to observe EU nature protection laws. Scientific investigations show various rare and strictly-protected species are being driven out of their protected area. Butendiek alone negatively affects 8.5% of the bird protection area, supporting NABU‘s prediction the region west of the island of Sylt "is the worst place for windparks in the North Sea," said Kim Detloff, NABU‘s marine protection expert. Germany is already under fire for weak implementation of Natura 2000 obligations, receiving a formal letter in January 2019 from the European Commission warning it to "establish necessary conservation measures to maintain or restore protected species and habitats to a favourable condition." The NABU complaint added to this action, which could end up with Germany making sanction payments. It also flagged up issues for other offshore wind projects such as Tennet‘s planned North Sea energy island which borders on Natura 2000 regions, added Detloff. It would be best for the birds if the 288MW Butendiek, commissioned in August 2015, was fully or partially dismantled, claimed NABU. Failing that, in view of Germany‘s renewables expansion ambitions, NABU demanded other effective measures such as extending the bird protection area boundaries, requiring offshore wind maintenance vessels to change their routes to avoid certain areas, to travel in lines rather than abreast, and to reduce their speeds despite the desire of chartered vessel users to fulfil their tasks as quickly as possible. 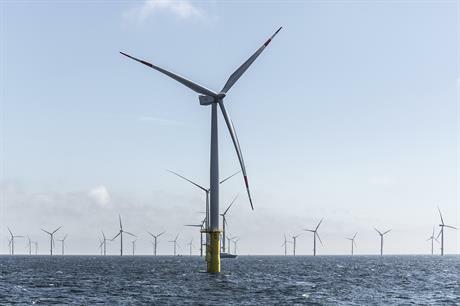 Germany‘s Nature Protection Office (BfN) responsible for nature protection in the German exclusive economic zone told Windpower Monthly Butendiek is the only German offshore project sited in a nature protection area. It added wind turbines are not excluded in principle from German or European bird protection areas as long as they do not cause substantial impairment to protection. In February 2019, BfN and offshore wind permitting authority BSH (Bundesamts für Seeschifffahrt und Hydrographie) discussed the findings with operators of the six projects. Butendiek is owned by Siemens Financial Services, Marguerite Fund, Industriens Pension, PKA, Wpd, CDC Infrastructure and EWZ.